This is one of those recipes, that only call for a few ingredients, are very easy to make and yet SO delicious that they will become a staple in your household. These little balls clearly fall into that category. No recipe testing was needed, they turned out perfectly in the first attempt and we couldn’t stop munching away on them – definitely a ‘keeper’. Who needs falafel anymore? Granted, one of the reasons I will be making them again and again is the sage butter. There is nothing that doesn’t taste even better with fried sage (yes, we’re talking vanilla ice cream with fried sage leaves here) and the combination with the salty Pecorino is just divine. I think it was when I ate Saltimbocca – veal lined with prosciutto and sage – for the first time that I was hooked. 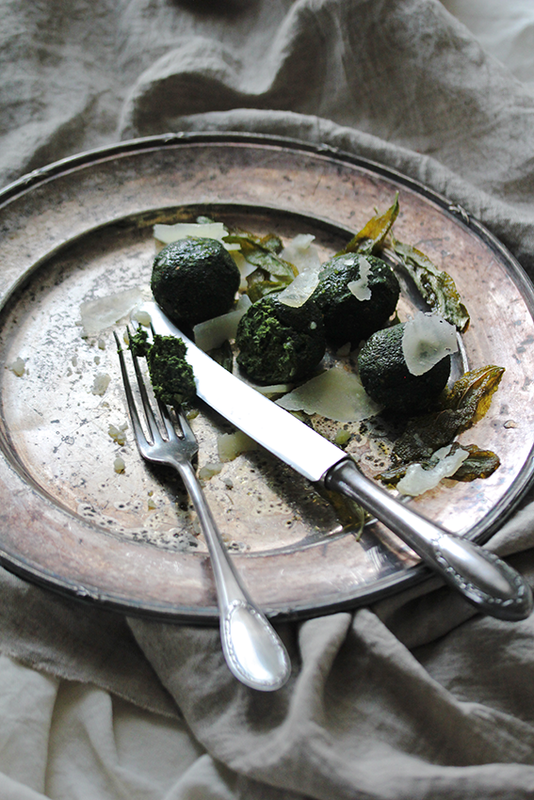 In fact, the spinach balls would be a perfect accompaniment for a dish like Saltimbocca and other veal or roasted chicken dishes. They also make a great starter for a Mediterranean menu or an addition to a buffet since they are the epitome of eating ‘from hand to mouth’. Preheat the oven to 160°C. 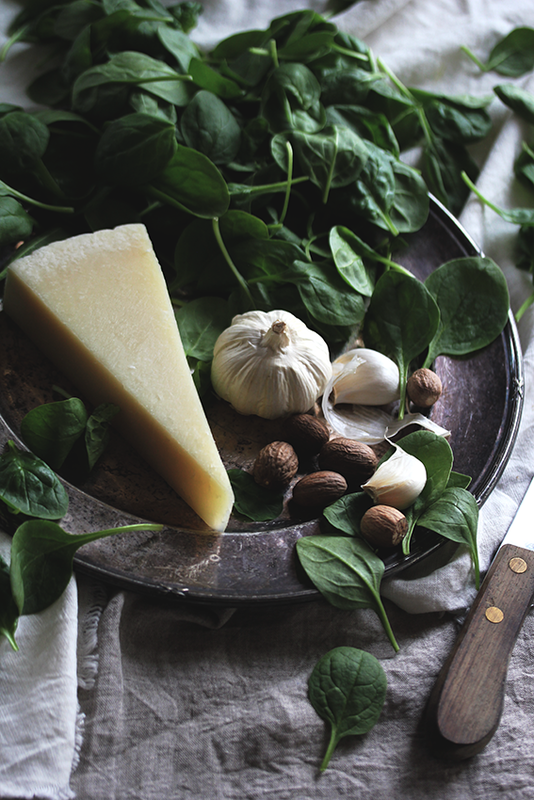 Either thaw the frozen spinach on low heat or gently sauté the fresh one. Place spinach in a strainer and squeeze out as much liquid as possible using a spoon. Shave off a bit of the Pecorino and set the shaves aside. Grate the remaining 120g of it. Add all ingredients to a food processor and mix until combined (you could also use a hand held blender). Form even sized balls with your hands, place them on baking tray lined with parchment paper and bake them for 12-15 minutes. They should slightly firm up, but make sure, you don’t bake them too long or they will dry out. In the meantime, melt the butter in a pan on medium heat and add the sage leaves. 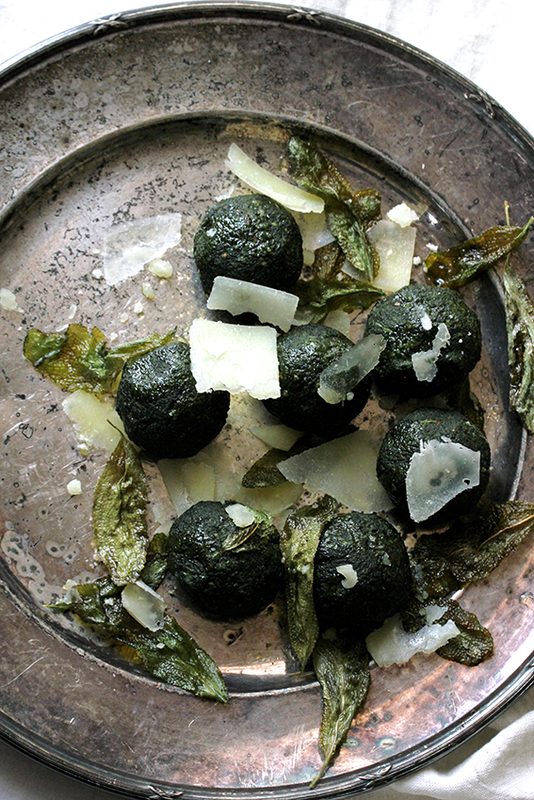 Take out the spinach balls, drizzle with sage butter and top with pecorino shaves. They are delicious when served straight from the oven, but are also great served at room temperature.